What is the Best Conditioner for Hair Loss in 2019? Hair loss is something we all experience at some stage in our lives. We actually lose 50 to 100 hairs daily, so finding a few stray hairs in the plug hole or on your hair brush is nothing to be alarmed about! It’s when your hair starts thinning or you notice bald patches that you need to worry. Genetics, or a medical condition called hereditary hair loss, is the most common cause of hair loss with recent studies suggesting 80 million men and women in the US suffer this type of hair loss. Hair loss is considered such a big issue in America today, that the American Academy of Dermatology has even deemed the whole month of August to be National Hair Loss Awareness Month! If your hair loss starts suddenly the cause may be due to an illness, diet, medicine or childbirth. More commonly, hair loss is gradual with it becoming more noticeable as we get older, maybe caused by hereditary hair loss or simply the body’s cell reproductions slowing down. Fortunately, whatever the cause, hair loss can be stopped or treated in most cases with either a visit to a dermatologist or by using over the counter shampoos or conditioners specifically designed for hair regrowth and to reverse hair loss. Suitable for men and women, this conditioner contains caffeine to help recover lost hair. Made in USA. Designed to promote a healthy scalp and energize hair from the roots to the tips, therefore reducing hair thinning. In clinical trials, this conditioner resulted in 60% less hair loss. In addition, includes biotin to thicken hair. Argan oil coats the hair, sealing in moisture, helping to prevent hair breakage and loss incurred through brushing. As we’ve already seen, genetics are the biggest cause of hair loss, also medically referred to as alopecia. There’s very little we can do to prevent it from happening, if your mother or father went bald or got thinning hair at an early age, there’s every chance you will too. Although we can’t stop it from happening, when it does we can either slow it down, put a halt to or reverse the process of hair thinning or loss. Male pattern baldness usually causes bald patches to appear on a man’s scalp but women tend to keep their natural hairline with a widening parting being the first sign of hereditary hair loss. It’s very rare for a woman to have noticeable bald patches or a receding hairline with men sometimes experiencing noticeably thinning hair as a symptom. Hereditary hair loss, or androgenetic alopecia, is the hair loss most commonly treated with over the counter shampoos or conditioners that may help you keep that full head of hair for a little longer. A more sudden and unexpected thinning or loss of hair can be indicative of an underlying medical condition with thyroid disease, lupus, diabetes, eating disorders and anemia all being known to cause hair loss. Normally if caught in time, and the underlying condition is treated, hair will return unless there’s scarring. You may still want to use a hair growth or hair loss conditioner to ensure your hair grows back just as thick as before, but you should check with a doctor before using any product that has powerful or harsh active ingredients. Which Ingredient Should You Look for in the Best Conditioner for Hair Loss? Minoxidil is a medicine applied to the scalp and often added to shampoos and conditioners for hair loss. It works by stopping hairs from getting thinner and stimulating hair growth on top of the scalp. Although it’s been approved by the FDA to treat hair loss, in many cases minoxidil can cause dandruff as it may cause skin irritation and a dry scalp due to a key ingredient; propylene glycol. Dandruff is always treatable with other shampoos or remedies and you shouldn’t have to choose between hair loss or a dandruff problem. Keratin is the protein which makes up the hair strands and was previously only used for hair straightening but keratin can also be useful for hair loss as it thickens the hair and adds volume while repairing damaged follicles. Amino acids added to conditioners for hair loss not only promote hair growth but are good for hair retention by supplying sulfur to the cells of the hair. Biotin ensures the growth of amino acids and is responsible for the cellular growth especially important for hair growth. The amino acids also manufacture red blood cells that deliver essential nutrients and oxygen to the hair follicles. Caffeine is one ingredient you may not expect to find in your hair conditioner but caffeine is a strong DHT blocker that blocks dihydrotestosterone (DHT) from damaging the follicle. Additionally, caffeine as a stimulant causes hair cells to produce more ATP (the energy used by biological cells) which helps the hair follicle continue to grow rather than shrinking. Unfortunately this doesn’t mean just drinking coffee can cure hair loss, it would take about 50 cups of coffee a day to see noticeable effects. Rosemary oil is commonly found in many conditioners too for its DHT blocking abilities. Conditioners for hair loss work mainly like a regular condition but with the added bonus of allowing hair to grow faster and thicker which will combat hair loss. Shampooing your hair with a hair loss shampoo, especially one of the same brand can see more effective results than using the conditioner by itself. After using the shampoo, you won’t need to towel dry it but simply remove the excess water and apply a small amount of conditioner onto the scalp, distributing it evenly throughout the hair and scalp. Some conditioners may have specific instructions, but in general the best results are obtained by leaving the conditioner to work for three to five minutes before rinsing off. Where possible try to choose a conditioner that has more natural ingredients as these will be gentler on the scalp and may be used more often for optimum efficiency. The last thing you want is flakes of skin falling off the scalp as well as possible strands of hair. A healthy scalp leads to stronger healthy hair vital for reversing or slowing down the hair loss process. 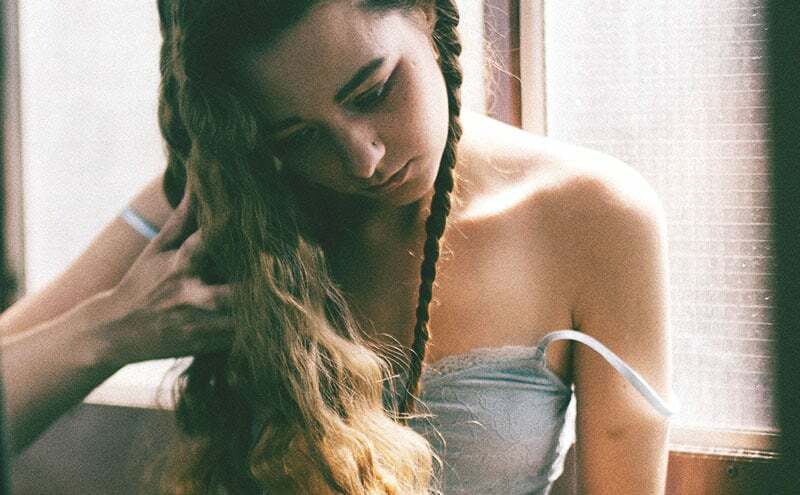 To help you choose the best conditioner for hair loss, we’ve put together five of the most effective hair loss conditioners that aim to reduce hair loss while being mild on the scalp and nourishing the hair. All five conditioners are over the counter treatments yet offer a powerful remedy for hair loss. Although incredibly expensive, with this formula you’re getting a lab strength hair growth treatment that really works. Caffeine, the main ingredient, has been shown when applied topically to extend and stimulate the life cycle of the follicles and encourage healthy hair. Thicker hair can often be felt after just one use. Jojoba oil cleanses the scalp of excess sebum and works to moisturize and stimulate the circulation on your scalp. Caffeine is highly effective and a strong natural DHT blocker. Chamomile extract in this product works to condition the follicles which strengthens the hairs. Both jojoba oil and chamomile stimulate circulation improving blood flow to the follicles to enable healthy growth of hair. Better results if used with accompanying Ultrax Labs Hair Surge Shampoo. but you get what you pay for! can be hard to get conditioner out. Smell isn’t to everyone's liking. This organic formula from Pura D’Or uses Aloe vera as the base instead of water more commonly found in other brands. Premium oils including argan oil and nutrients that include biotin and niacin strengthen the hairs from the root to tips, reducing hair loss through breakage. 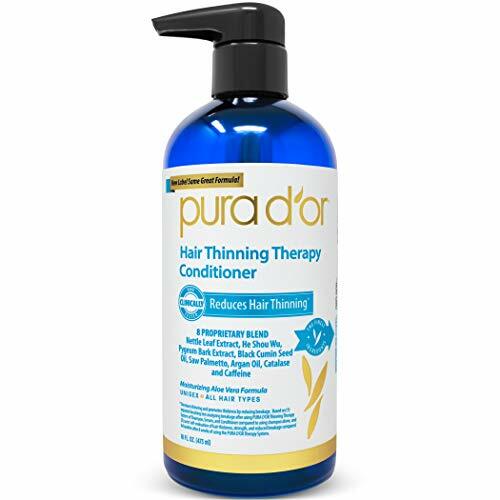 Clinical trials by Pura D’Or show that 75 percent of customers felt there was more hair on their heads after eight weeks of using this product. Pura D’Or are renowned for their wholly natural quality products. USDA bio-based product scoring shows Pura D’Or at 75 to 95 percent for all products. catalase and cayenne help stimulate dormant follicles and are natural DHT blockers. Antioxidants and other natural ingredients detoxify the scalp encouraging healthier hair growth. Sulfate free but meadowfoam estolide gives a luxurious lather similar to SLS based shampoos or conditioners. Very reasonably priced for quality organic conditioner. Very natural smell—some customers described it like the fertilizer section of a garden store! More for preventing hair loss through breakage than regrowth—use with a hair growth or thickening shampoo for better results. Conditioner is very thin compared to similar products. Some bottles are shipping with the DHT blockers removed—check before ordering. 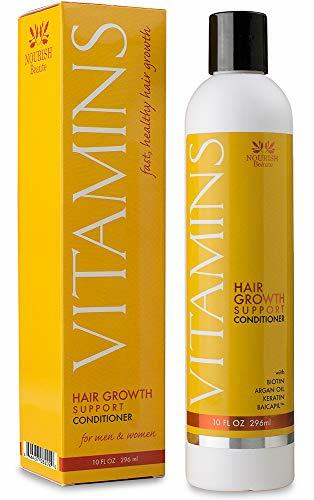 Vitamins hair loss conditioner is formulated with many ingredients that have been proven to be effective in preventing hair loss and the growth of thicker, stronger hair. Keratin, caffeine, argan oil and even caviar extract are included. Coconut, jojoba and castor oils nourish the hair and scalp and encourage hair to grow healthier and faster. Nourish Beaute claims a 168 percent growth of new hair and 60 percent less hair loss during clinical trials. Conditioning treatment detangles hair and adds moisture. Oils can leave finer hair feeling greasy. Encourages growth but doesn’t really thicken hair already on the scalp. Many customers found hair lacking volume after using. This professional salon-quality conditioner from Bloom Krans uses only the most natural ingredients that don’t harm your hair or scalp. These include horsetail extract, coconut oil, matricaria extract, colloidal oatmeal and cucumber extracts.These extracts have been professionally studied for their abilities to address the problem of hair thinning and hair loss. Works with any other hair loss shampoo or hair growth treatments. Coconut oil adds rich moisturizing qualities. gentle on the scalp and won’t leave flaking. Natural DHT blockers protect the follicles. 90-day money back guarantee if you’re not able to see visible results. this product can be used by men but the smell may be too floral. Customers with fine hair may find this conditioner too heavy. Very small bottle size—users with longer or thicker hair may run out of conditioner quickly. This restorative conditioner from Majestic Pure uses argan oil and coconut oil to nourish the hair and scalp follicles. Argan oils work by coating the shaft of the hair and preventing environmental damage. Coconut oil assists by removing any buildup of oils on the scalp making it less likely to suffer from inflamed follicles, which can be a major cause of hair loss. Fatty acids deeply nourish the scalp and hair. making it more manageable and less likely to break from brushing or styling. Sulfate free; safe to use on colored hair. Some users described smell as “cheap men’s cologne” so may be overpowering. Conditioner can leave the hair dry and tangled. some chemicals may irritate the scalp. When looking at products for hair loss, it can be hard to believe the many outlandish claims some manufacturers make. Hair loss is not curable but can be halted or slowed down with the right treatment. Try to choose a conditioner that has DHT blockers to reduce follicle damage which causes hair loss and ingredients that can thicken the hair you already have on the scalp. A healthy scalp and hair strands are vital when you start experiencing hair loss so find the right conditioner for you that doesn’t irritate the scalp and leaves hair healthy and shiny. Although considerably more expensive than many other conditioners our top recommendation for the best conditioner for hair loss would be Ultrax Labs Hair Solace Caffeine Hair Loss Growth Stimulating Conditioner. Sometimes more doesn’t equal better, and the Ultrax Lab formula of just three active ingredients; caffeine, jojoba oil and chamomile extract prove very effective at stimulating hair growth while strengthening and nourishing the hair. What is the Best Hair Thickening Shampoo for Men in 2019? Can Garlic Oil Promote Hair Growth?